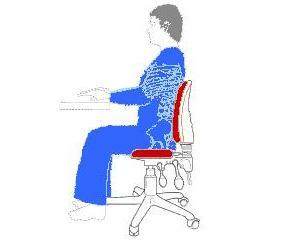 The SitBones Ergonomic Office Chair acknowledges the crucial role the Ischial Tuberosities ("sit bones") play in order for us to sit with the correct posture. The SitBones ergonomic office chair is designed to enable the "sit bones" to carry the upper body weight all of the time. When the weight is carried by and centred on the sit bones, the other body muscles do less work and are most relaxed. 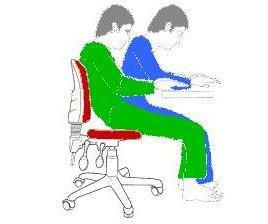 Using less energy to sit allows more energy for staying alert, focussed and productive. 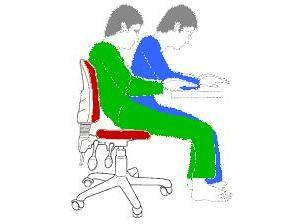 The short seat ensures full back support, maintaining the body in correct spinal alignment. The SitBones chair promotes maximum leg movement minimising any constriction of blood flow to the legs and other parts of the body. At the same time, the vertical spinal alignment allows the chest and lungs to fully expand, increasing both the lung capacity and blood flow to the body, supporting good health. With an erect spine, full back support and a balanced upper torso, the SitBones chair helps the sitter achieve an alert clarity of mind, maximising creativity and productivity.